Update Jan 2008: The project has been sold and will be developed as apartments instead of condos. EXPO 62 (website) is Intracorp’s latest condominium development located in the lower Queen Anne neighborhood (map). As the name implies, EXPO 62 pays homage to the 1962 World’s Fair also known as the Century 21 Exposition which took place across the street at the Seattle Center. The seven-story complex features 114 condominium homes consisting of studios, 1-bedroom, 1-bedroom + den, 2-bedroom, penthouse and 13 two-level live/work lofts. Homes will range in size from 422 sq ft for a studio to 1,545 for the largest live/work loft. 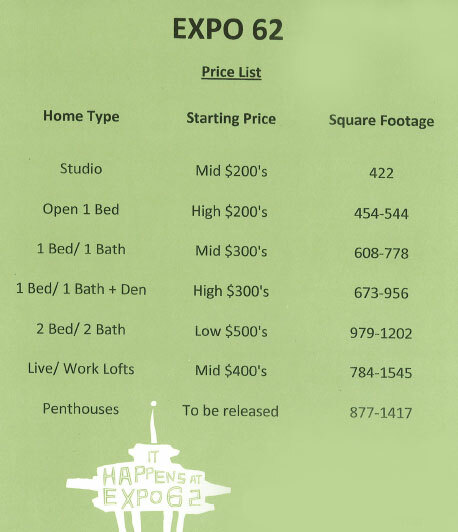 Prices are still to be determined but EXPO 62 has provided a pricing guideline with associated square footage for each style of home. EXPO 62 expects to have finalized pricing available in about two-weeks. EXPO 62 will not be accepting reservations, interested buyers will go straight to purchase and sale which are expected to begin within the next month. EXPO 62 design concept is largely based on the De Stijl artistic movement in Holland during the early 20th Century which explains some of the color choices of the interior finishes. However, EXPO 62 also offers color and design schemes for more contemporary Northwest sensibilities. As for location, it is set off of busy Denny Way providing residents a quieter environment compared to Trio or Matae which are right on Denny Way. Homeowners will also enjoy strolling through the Seattle Center and partaking in many area businesses including Jalisco’s, Tini Bigs and Cafe Minnie’s which are steps away. Completion for EXPO 62, which is currently under construction, is slated for Summer of 2008. Currently, the EXPO 62 Presentation Center is open on the weekends from 11:00 AM to 6:00 PM at 159 Denny Way. For more information about this or other projects, please contact us. Any updates on pricing? Thanks! Hey I just saw on another blog that Expo 62 was just cancelled and will be converted to apartments. The developer has sold to an out of state investor who will release the building as an apartment complex. Is this true? Thanks for the update, Staci. While I haven’t received word on it directly, I do trust James if he says his reservation was terminated due to the sale. This had been rumored for several months now.